CHAPTER I. 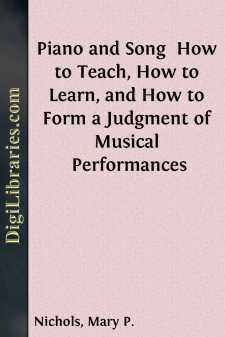 ON ELEMENTARY PIANO-FORTE INSTRUCTION. You ask, my dear friend, for some particular information about my piano method, especially with regard to my mode of elementary instruction, which differs essentially from that in common use. Dominie. My dear friend, how have you managed to make piano-playing so utterly distasteful to little Susie? and how is it that the instruction which you have given her for the last three years actually amounts to nothing? Friend. Well, I will tell you how I have proceeded. First I taught her the names of the keys, that was pretty dull work for her; then I made her learn the treble notes, which was a difficult matter; after that I taught her the bass notes, which puzzled her still more; then I undertook to teach her a pretty little piece, which she hoped to perform for the delight of her parents. Of course she constantly confused the bass and treble notes, she could not keep time, she always used the wrong fingers and could not learn it at all. Then I scolded her,—she only cried; I tried a little coaxing,—that made her cry worse; finally I put an end to the piano lessons, and she begged me never to begin them again; and there you have the whole story. Dominie. You certainly might have begun more judiciously. How is it possible for a child to climb a ladder when not only the lower rounds, but a great many more, are wanting? Nature makes no leaps, least of all with children. Friend. But did she not begin to climb the ladder at the bottom? Dominie. By no means. She certainly never was able to reach the top. I should say, rather, that she tumbled down head foremost. To speak mildly, she began to climb in the middle; and even then you tried to chase her up, instead of allowing her, carefully and quietly, to clamber up one step at a time. Bring me your youngest daughter, Bessie, and I will show you how I give a first lesson. Dominie. Bessie, can you say your letters after me? so,—c, d, e, f.
Bessie. c, d, e, f.
Dominie. Go on,—g, a, b, c.
Bessie. g, a, b, c.
Dominie. Once more: the first four again, then the next four. That's right: now all the eight, one after the other, c, d, e, f, g, a, b, c.
Bessie. c, d, e, f, g, a, b, c.